"AI's first half–century produced great accomplishments, but many of the field's successes have remained unsung beyond the AI community. AI's integration into the fabric of everyday life has had tremendous impact, but the public may not recognize its many roles or understand its fundamental goals. In response, AI Magazine has developed a poster to help educate students, faculty, and the public about AI and to spur them to find out more about the field. The poster's design was based on input from experts on how to convey key aspects of AI and to capture the imagination of a broad audience. The design does not attempt the impossible feat of summarizing all of AI–or even a substantial part–in a single poster. Nor does it present a list of new advances, which would soon become obsolete. Instead, it presents a snapshot of a few aspects of AI selected to catalyze interest and to prompt viewers to find out more by exploring AAAI Web resources. 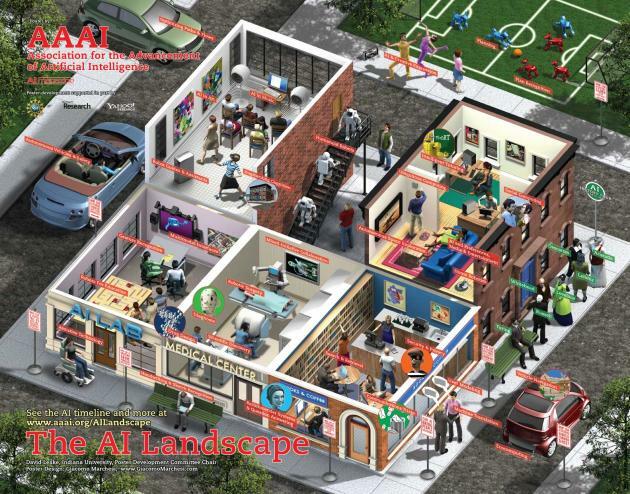 The resulting poster, The AI Landscape, is inserted in this issue of the magazine. The AI Landscape provides a glimpse of AI's multifaceted role in service of society, an illustration of the types of questions being addressed by the field, and a pointer to Web resources including a timeline tracing the field's history." 3D • accomplishments • AI • AI Landscape • AI Magazine • artificial intelligence • Association for the Advancement of Artificial Intelligence • Carol Hamilton • David Leake • Douglas Fisher • Edwina Rissland • everyday life • Harold Cohen • history • illustration • impact • innovation • isometric projection • James Gary • Microsoft Research • National Science Foundation • poster • snapshot • technology • technology poster • timeline • visualisation • Yahoo!